The third most-populous state in the US, Florida State is one of the leading tourist destinations in the world, with a long history of innovators in industry, travel, and science. With this heritage in mind, we’ve collected ten of the most influential sites that helped create the Sunshine State. Built by developer and Standard Oil co-founder Henry Flagler, the Ponce de León Hotel was conceived as a luxury Spanish Renaissance venture, and was the first hotel of its kind to be made entirely of concrete. The hotel was the first of Flagler’s many projects on Florida’s east coast. He fell in love with the state after vacationing there with his wife. In addition to its concrete construction, the hotel was one of the first to be wired for electricity. The original building and grounds now operate as a part of Flagler College. Naval Air Station Pensacola, otherwise known as “The Cradle of Naval Aviation,” is a United States navy base built in 1914 at the urging of Captain Washington Irving Chambers. The station was the first naval aviation station, and today serves as the first training base for aviation personnel within the US Navy, Marine Corps, and Coast Guard. It also provides advanced training for most Naval Flight Officers, and houses the famous Blue Angels. Although the area now known as Miami Beach was inhabited as early as the 1880s, the coastal resort destination we know today did not emerge until developer Carl Fisher put immense resources and effort into the soggy real estate. The area was soon transformed from a jungle-like sand bar into an area for America’s elite in the Prohibition Era, complete with luxury hotels, polo grounds, a harbor, and illegal alcohol shipped from Cuba. 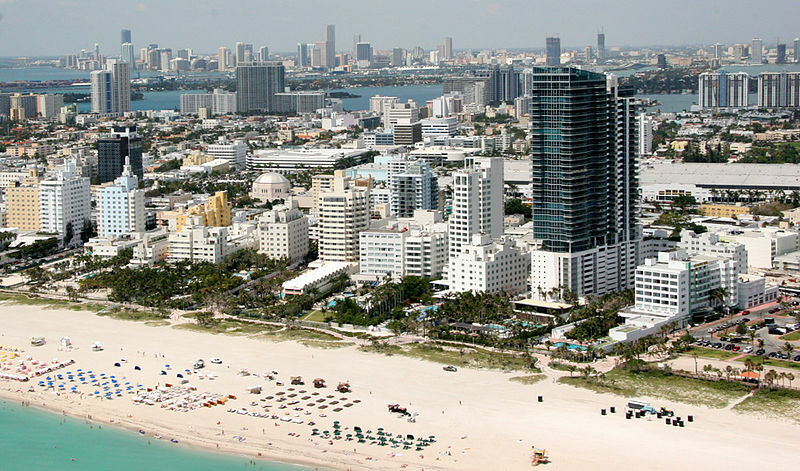 Today, Miami Beach is a popular international resort destination, and home to industries ranging from tourism to the military. Another venture by Henry Flagler, the Overseas Railroad was a connection of the Florida East Coast Railway to the city of Key West, located 128 miles south of Florida’s mainland. The construction of the railroad was difficult as it required 156 miles of railroad track, most of which needed to be laid over water. The project took seven years to complete, opening in 1912, and operated until 1935, when it was partially demolished in a hurricane. After its destruction, a large portion of the remaining bridge was used to construct the modern Overseas Highway. Born in the initial wake of Fidel Castro’s dictatorial reign, Little Havana is a neighborhood within Miami noted for its large percentage of Cuban exiles. The neighborhood has been described as a “city within a city,” as many of the first generation of immigrants from Cuba did not assimilate into the surrounding Miami culture, but instead created their own miniature version of their native Cuba. Today, Little Havana is well-known for its “Calle Ocho” district, which has several restaurants, small businesses, and a vivid street life. The most visited resort in the world, Walt Disney World was first conceived by businessman Walt Disney to supplement his original park Disneyland in California. Disney considered numerous locations for Disney World, including St. Louis, Missouri; Niagara Falls, New York; and Washington, D.C., among others. But Disney settled on Florida for its favorable weather, large expanses of undeveloped land and developing network of interstates. Disney’s amusement park eventually grew from its initial Magic Kingdom to include four theme parks, various hotels, and other ventures in the greater Orlando area. After the recommendation a committee co-chaired by Dr. Kurt Debus, NASA established what would become Kennedy Space Center on Merritt Island in 1962. This recommendation placed Florida at the center of the nation’s space research, and the state continues to be an international leader in science and technology. A 275-mile stretch of road that crosses Southern Florida, the Tamiami Trail is to thank for the development of the Fort Myers and Naples areas in Florida. The road, which connects Tampa with Miami, was completed thanks to oversight and funding by landowner and developer Barron Collier. The Tamiami Trail was the first road to cross the southern part of the peninsula, opening up the previously hostile Everglades for travel, and greatly expanding the economic potential of southwest Florida. Many people cite Jamestown, Virginia as the first permanent European settlement in the United States. In reality, 42 years before Jamestown’s founding, St. Augustine was founded as the first European city in the present-day U.S. Spanish conquistador Pedro Menédez de Avilés founded the city in 1565. The city, centered around the Castillo de San Marcos fortress, survived many attacks during its time under Spanish rule. As Florida’s population began to grow in the late 1800s, St. Augustine was the first place to pull the attention of many incoming entrepreneurs and businessmen to the region. A network of roads that connected the U.S.-Canada border in Michigan with Miami Beach, Dixie Highway was one of the first automobile roads into Florida . Another vision of Carl Fisher’s, Dixie Highway eliminated the need for people to take the railroad to reach Florida. Want to learn more about the people and places that have built Florida State? Check out Arcadia’s exciting new title Florida Made: The 25 Most Important Figures Who Shaped the State, or one of our titles on Florida towns and culture.